Thank you so much for your time visiting our newest post. We have some unfortunate news to share. Due to new opportunities with Management & Bartenders; we will no longer offer weekdays. FEAR NOT! Those who have secured our services for Friday's, those agreements are guaranteed! For those who are newly looking to inquire for Monday through Friday, we will no longer have the availability to support these dates. Please send an inquiry if you have a need on Saturday & Sunday (ONLY). Thank you so much for reading, and your understanding; we look forward to supporting your open bar needs. Thank you so much for a wonderful 2018 year! We're so happy to have met so many wonderful clients, brides, grooms, mother of the bride, mother of the groom, vendors and new venues alike! We're sad to say that we're closed for the winter holiday's but we do need our time to rest, reset, and gear up for a new 2019 year. You're still welcome to leave us email inquiries, and assessment forms. We will get back to you as soon as we can upon our return. Please allow us 7-business days upon our return. We will officially be gone from Sunday-12/16/2019 through Saturday-1/05/2019; catching up to emails that entire week. Wishing all of you folks a warm and happy holiday's & a safe and memorably New Year! See you all in 2019! We're excited to introduce our new JOBS tab. 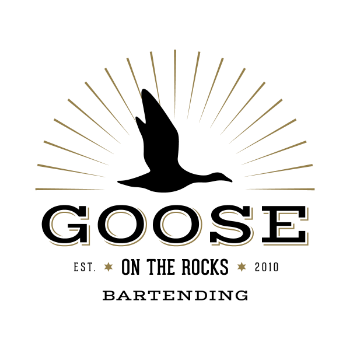 Goose on the Rocks is always looking to hire new talent but we look for a very unique and specific professionals that we feel fit our growing family. If you'd like to join the flock, send us an application. We look forward to hearing from you!